I somehow ended up on Martha’s site the other day looking for recipes on the grill. Yes, yes, I know it’s fall people, but I love my grill and use it whenever I can, even in the snow! I printed off oodles and oodles of different recipes, but settled on this mouth watering marinated chicken as my first pick. I am so very glad that I did! Not only did I savour every morsel at dinner that night, I had it for lunch the next two days and used the rest to make a chicken salad. This marinade is so simple it’s almost embarrassing. With only four ingredients this marinate gives the chicken an amazing flavor that you will absolutely love. I will admit though, after cooking from Julia Child’s book, Mastering the Art of French Cooking, I’ve learned a few things. One of those lessons include drying off the meat before cooking it, and if marinated, to wipe off the excess marinade first. Other than that, Martha’s instructions are pretty much dead on. Instead of oiling the grates of my grill, which has melted a few brushes in the past, I brush a little olive oil on the dried chicken so it won’t stick. 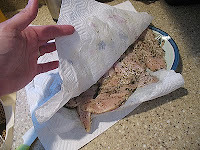 I also marinated my chicken in the refrigerator most of the day, and then an hour and a half before cooking it, I placed it on paper towels and brought it to room temperature. As for the potatoes, I’ve also learned to dry those, so after patting them dry they went into the foil packet as described below. I was really surprised at how perfect they were! Heat grill to medium. Fold two 4-foot-long sheets of aluminum foil in half to make two separate double-layer sheets. Place half the potatoes on each double layer. Form two packets, folding foil over potatoes and crimping edges to seal. 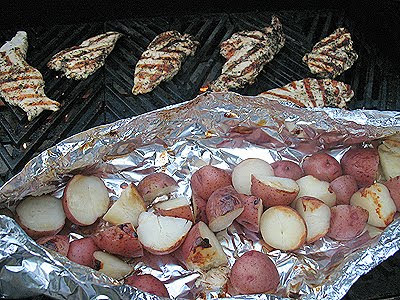 Place on grill and cook, turning over once, until potatoes are tender, about 25 minutes. Remove from heat. Leave potatoes from one packet wrapped in foil to keep warm. Open second packet to let potatoes cool; reserve for Potato Salad. Raise grill to high; lightly oil grates. Meanwhile, make marinade: In a large baking dish, whisk together oil, garlic, vinegar, thyme, 1 teaspoon salt, and 1/2 teaspoon pepper. Add chicken; turn several times to coat. Let marinate at room temperature 10 minutes and up to 30 minutes. Lift chicken from marinade and grill until browned and cooked through, 2 to 3 minutes per side. Remove from grill. Cover half of chicken with foil to keep warm. Reserve other half for Grilled Chicken Cobb Salad. 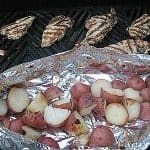 Remove warm potatoes from foil; transfer to a medium bowl, toss with butter, and season with salt and pepper. In a medium bowl, toss asparagus with Vinaigrette. Serve the grilled chicken with potatoes and asparagus. Garnish with thyme sprigs, if desired. That sounds good Kim! I have made chicken on a stick yes, so yummy! Grilled potatoes sound yummy. Man, that snow scares me. Oh goodness look at all that snow! We shovel a path to our grill too…but this is urging me to get out there while it is still "warm"! You know what? 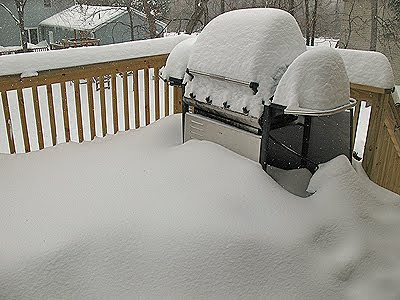 I totally love grilling in the snow, too! Just something about standing over the grill with the delicious smokey smells all around and the chilly air and whit all around!! This sounds awesome. MMmmm.. two of my favorite words.. Garlic and potatoes. Yum. It's 79 degrees here in CA, so BBQ sounds wonderful. I never thought about drying off the marinade. Thank you for the tip. Grilling in the winter is great, cause then it's not so hot that you sweat just making dinner! This sounds yummy. Yummo! Looks delicious! Some of my happiest memories with my kids are of cooking Chinese food out on the grill in the snow together, because our power was off due to inclement weather! I like to use my grill year round too! Luckily I have a covered patio! The recipe sounds great! 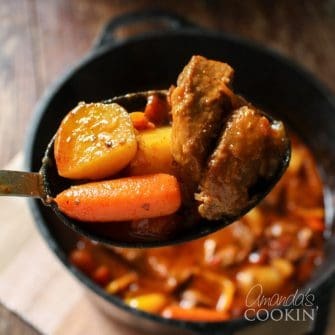 The recipe looks great and i love the tips…we also love your snow picture, we agree about the shovel.